Adele has received her second reno project and it's in today's window! 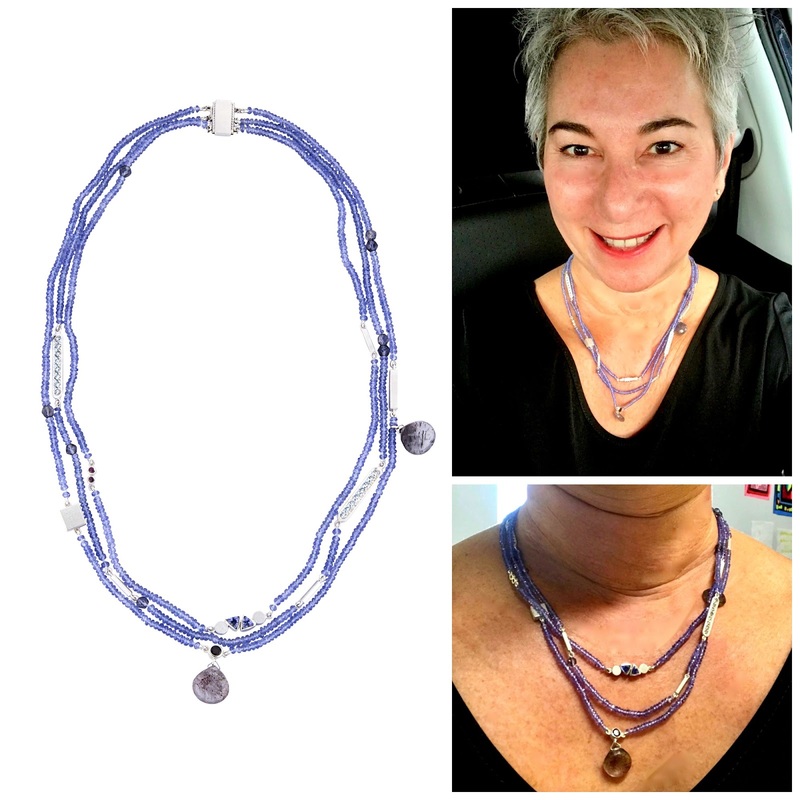 She sent this photo of tanzanite beads, a gift from her husband, to the renowned jeweller Janis Kerman, with a request to make it wearable for her casual lifestyle, and to add interest. She also had bits and pieces: hoop earrings with small, princess-cut diamonds; a pair of Israeli artisan-made earrings from her sister-in-law; another pair with sapphires; a ruby cocktail ring from her mother-in law. Some were silver, others gold, which Adele no longer wears. At this point Adele had to make a few initial decisions: whether to use only the 'bits', or invest in some new elements. My take is that you're likely going to benefit from a few new additions when you are hoping for a piece such as Adele wanted, both to update, and to give the artist some breathing space. Just like a house reno, this is the stage of a project where you typically pay a design fee, and decide what to add or change, in light of your budget. Below, the reveal! The hallmark of a Kerman piece is that when an element turns, it is just as interesting and well-finished from the other side; everything's made to move and twist. 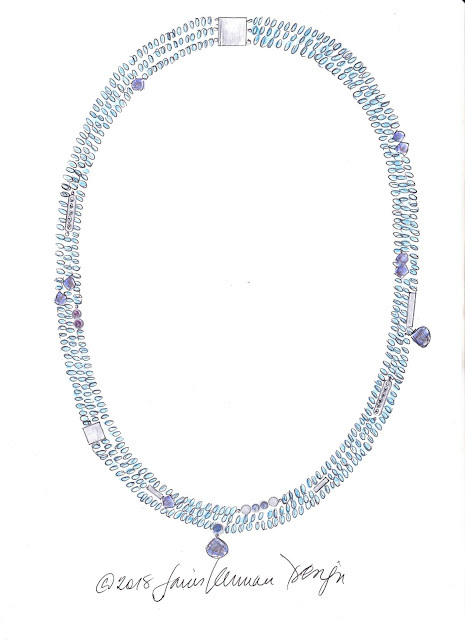 The violet-blue of fine tanzanite is gorgeous with Adele's hair, the ruby pear-shaped briolettes add a funky texture, the silver and diamond elements and new clasp are cool and current. The piece captures love and family memories; Adele says she enjoyed showing her husband how their family's gifts are now combined. 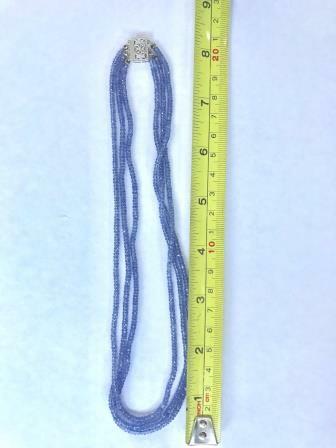 Left: The necklace, photo courtesy Janis Kerman. Upper and lower right right: Adele off to work in the new piece. She can wear it anywhere! Now, the one mournful note: Janis Kerman has retired and she really means it; Adele just got in under the wire. I will just have to find more available dream jewellers to show you, but worse luck, no? Lovely transformation and beautiful drawing. The necklace really suits your friend. I had never heard of that beautiful stone. I hope it is sustainable in terms of the environment and working conditions in Tanzania. Laura: Yes, how I would love to see it in person! lagatta; If worried, you can research practices in the Tanzanian mining industry. Gorgeous. Love the colour, the design, everything. It’s a magical transformation. Wearing that piece would be such a delight each time. I love the drawing too. Outstanding! What a beautiful and wearable necklace! Lovely necklace, and it is so Janis Kerman! Yes, now you must find another jeweler! A lovely necklace and a gorgeous colour. what a beautiful example of skill and artistry! She has great skill; I've had her work on some earrings I feared would shatter the stones but she fixed them perfectly. She also repaired some other silver pieces for me. Her work is meticulous and creative. She told me she'd work with whatever I have to make custom pieces. The jewelry she made and wears herself is fantastic. Her prices were very reasonable for the work she did for me. This is a great example of what a fine artist can do. I have to admit that I thought the necklace would be too small and sweet, based on the drawing. But the shapes, color and textures are perfectly balanced. And, even better, it looks fabulous on Adele. I am thrilled with the necklace and love wearing it! It took me a while to save up for it, and a leap of faith to send everything to Janis, but through our correspondence she pegged me correctly. I love bold, larger pieces but would not feel comfortable wearing them. She created interesting elements to fit my style. Carol in Denver: It's wonderful when you find someone whose work suits you perfectly, Then you can build a relationship and also be confident about undertaking custom projects. Adele: Three galleries still carry the last Kerman pieces; ons is here, one in Seattle and one in Australia. YOu are so lucky to get this made. Leslie: You might enjoy Janis Kerman’s site, to see other pieces. This is on the smaller scale of her necklaces but her stlyle is not delicate ( such as Cathy Waterman’s.) Lots of geometric shapes and asymmetry; her earrings are nearly all mismatched.